These sources are presented as-is. Use at your own risk.  dir.c C program to output filesize, file modification date (m/d/Y T), and filename. Useful for processing groups of input files.  hex.c Hex dump a file for detailed examination.  hexcat.c Similar to hex, but honors newlines found in file.  mac2ux.c Pipe fitting to convert files with \r line termination to \n line termination.  mdate.c Return modification date of a file. Posted to SAS-L Nov 03, 1999.  splash-countdown Generate jpg images and display them in a borderless window as a series of splash images. Requires windows program Splash.exe.  uga.vbs.txt Small visual basic program to open the listserv.uga.edu web interface to SAS-L, showing newest posts first. This code could easily be adapted to a bookmarklet.  constant Demonstrates lack of optimization by DATA Step compiler. Advice: Don't use constant() inside a large loop.  date-formats Lists the output of every SAS date related format. The log.  beers-n-bars Which bars sells the beers a drinker likes ? Or Which sets contain which subsets. SQL and bitcoding.  cartesian-join From a set of N points, keep only the pairs of points which are closer than some threshold. A Data step solution and an exquisite SQL solution by Howard Schreier.  hash-3 Some pitfalls you might encounter. Read access violation and missings turned into zeros.  hash-4 Transpose and concatenate satellite data while key merging disordered sets.  hash-5 Sum amounts in a transactional trail.  hash-6 Split a table into subset tables based on variable values aka Split one data set into several data sets named according to a group variable. Material posted in 24MAY2004 SAS-L thread "Hash of hashes and dynamic output"
 hash-7 Hash of hashes idea (see hash-6) expanded into a useable multi-level-hash (MLH) construct by using macros. See multi-level-hash for the macros. An MLH in essence provides for arbitray navigation of the class levels of a hierarchy within the providence of a DATA Step. Important: Any PROC Step that provides a CLASS or BY statement allows you to process data that is hierarchically segregated into groups. Use Procs instead of MLH in most every case. I have yet to find a reasonable sample problem that demonstrates MLH as the principally simplest solution technique. If one is found it will probably involve atypical path following algorithms or recursive searches. MLH is a technique waiting for a problem. A response to 17AUG2004 SAS-L thread "How to group people by their first name OR last name"
 how-much-hotter-it-got A pot can contain 20 components. The temperature is known for every combination of components. How much hotter does the pot get when one new component is added to the pot?  increment-every-other Increment a counter every other observation.  least-likes A collection of like clauses likely overlaps. What are the fewest like clauses that would match the same things as all the like clauses. a_new = value of variable ("a_" || n) uses a functional mapping to avoid more complicated general purpose hash.  polygon-hunt An unordered data set of line segments having unique vertices are known to be pieces of polygons. Enumerate the vertices of each polygon and indicate if the order is clockwise or counter-clockwise.  random-schema Create a SAS library containing a complicated schema involving dozens of tables and dozens of referential relationships.  rolling-back-sums At time T, a computation based on attribute values in prior observations occurring within prior interval I is to be made. Sample involves buying and selling volumes. Adaptable to any process requiring a rolling back calculation.  superset Find the fewest mutually exclusive supersets S* such that each S* contains all sets S sharing at least one member. Demonstrates how to program a recursive algorithm using GOTO and ARRAY to emulate functional calls with stacks.  pdf-bullets Characters in ITC Zapf Dingbats font make excellent pdf bullets. Generate a sample showing each.  pdf-bullets Place bulleted text in a pdf document.  excel-multisheet Use windows shell script to create a new Excel workbook containing several worksheets, each populated from an html file. Each html file is generated using ODS and contains Proc TABULATE results for one by-group.  report hbar Generate hbar charts per by group using Proc REPORT and ODS. Sample output.  tabulate Proc TABULATE - Use the page dimension of tabulate to place a title above each table created in a single Proc step. Sample output.  tabulate-with-graph Generate a two page report in pdf format. Contains a tabulation and vertical bar charts.  annontated-chart A stacked vbar chart annotated to display counts of another subgroup.  cowboy-hats Use GREPLAY to print 200 plots, 2 plots per page. Sample uses 200 cowboy hat plots.  font-dump View all characters of any or all SAS fonts. Windows platform can also examine true type fonts. Notes: SAS font samples can also be found in the OnlineDoc. Special symbols that can be indicated in a SYMBOL statement can also be found in the SPECIAL font. 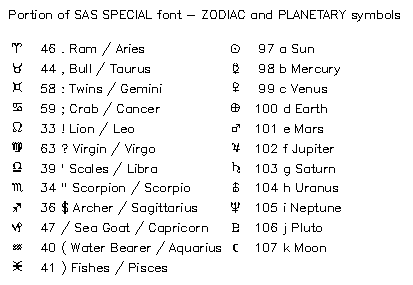  font-zodiac Zodiac and planetary symbols are found in the SAS SPECIAL font.  G3D-annotated Surface function plot annotated with data points. Change in view point animated using gifanim graphics device. Sample output.  gchart A stacked vertical bar chart with groups.  gfont-quadrants SAS/Graph custom font created with Proc GFONT. The sixteen possibilities of a circle with it's quadrants filled and unfilled. This font uses circular arcs, which in my estimation contains too few sampling points. A thumbs down on circular arcs.  gfont-moon-phase SAS/Graph custom font created with Proc GFONT. Shows N phases of the moon. You choose N. This font does it's own arc computations and at small sizes looks better than if SAS circular arcs were used. A combination of Java classes and SAS macros that let you can create almost any type of static 2D visualization as an image file (PNG and JPG are built into JRE). The impetus at the time of this development was the lack of antialiased line drawing in SAS/Graph. jDSGI.zip - The gallery codes zipped together and ready to roll.  l1-traveling-salesman A traveling salesman, cities on a grid and shortest path to next city. Cities can be made to exist on a spiral :). Inspired by Martin Krzywinski's schemaball. 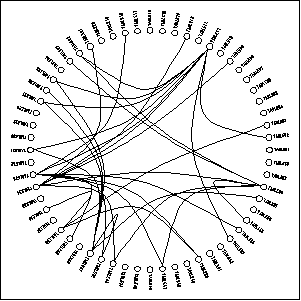 Run the random-schema program to fill a library with randomly related tables.  state-chain An NPR puzzle: The last two letters of ALASKA are the first two letters of KANSAS. 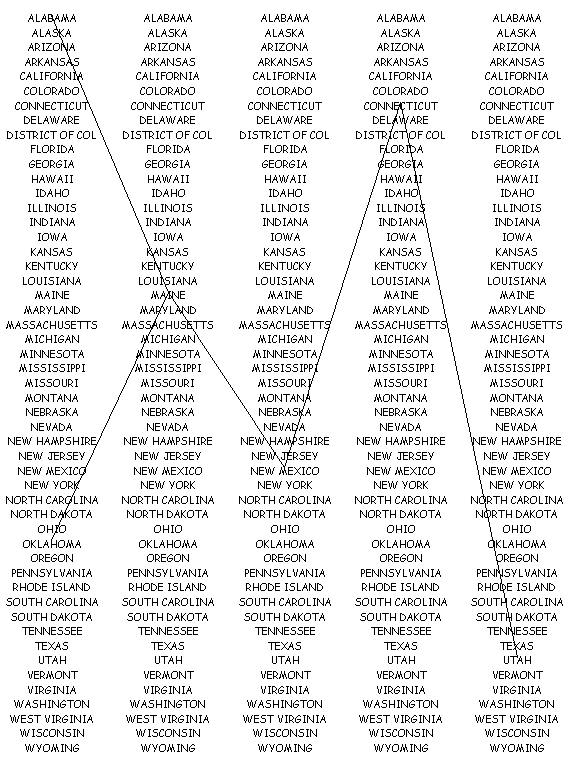 Can you find a chain of five state names that overlap like this, in which the last two letters of each are the first two letters of the next. See the answer.  vbar-by-group Ensure all midpoints are same patterned even when some by groups do not contain all midpoints found across all the by groups. Sample output.  amicable-numbers A pair of numbers, the factors of each when summed is the other.  joy-to-the-world Generate wave forms of pure tone notes and play them back through the audio device in the form of the song "Joy to the World". Tested on Windows 2000.  sudoku Solve Sudoku puzzles using a path walker. Simple front end for tracing through each step. A. What is the most number of rows table fakedata could have ? B. What is the least number of rows table fakedata could have ? This page was last updated 30 May 2007.